Out here, there is no good and there is no bad. To survive out here, you've got to out-monster the monster. Can you do that? (SPOILERS) John Hillcoat comes something of a cropper with this contribution to the heist genre, although not nearly as much as some of the reviews suggest. Triple 9 is a mess, but it’s a mess populated by a selection of strong (and some not so strong) performances and impressively energetic direction. This may be very much a Heat-wannabe, and suffers from the comparison, but ultimately I was more engaged by its ambition than put off by its shortcomings. Probably the biggest of which is that it simply lacks sufficiently strong characterisation to justify its spinning wheels of dodgy cops, good cops and malicious mobsters. One wonders if great chunks of Triple 9 were left on the cutting room floor. Certainly, it had its release date pushed back six months. On the one side we have a couple of ex-SEALs (Chiwetel Ejiofor, Norman Reedus) and their co-conspirators Aaron Paul (as Reedus’ brother, an ex-cop) and bent coppers Anthony Mackie and Clifton Collins, Jr. On the other, there’s Casey Affleck as Mackie’s new partner and Woody Harrelson as Casey’s detective sergeant uncle, investigating the robbers’ case. Then there’s Kate Winslet supporting some impressively sculpted BIG hair as the wife of an imprisoned Russian-Jewish mafia boss and Gal Gadot as her sister (and Ejiofor’s wife). So there’s a plethora of heads to keep a count of. Unfortunately, Hillcoat and writer Matt Cook (the upcoming Patriots Day) have difficulty keeping tabs on any of them. When it comes to the heists, or a particularly standout sequence where Mackie and Affleck enter an apartment building and give chase to a suspect, the picture becomes enervating and pulse-pounding. It’s in the whys and wherefores of what they do that Hillcoat and Cook let things slide. While it isn’t as if Heat needed to go to great pains to underline the motivations of its characters – so it was certainly within Triple 9’s grasp – the thieves here remain less than slender of purpose. Ejiofor appears to be the ostensible leader and the character with the clearest discipline and code, yet his under-duress jobs for Winslet aren’t entirely convincing; he just wants to see his son, the stuff of crude melodrama, which doesn’t really explain his fellows’ motivation, given the high stakes involved and Kate’s rather reckless willingness to dispose of team members as a showing of meaning business (thus limit the chances of her getting her prize). 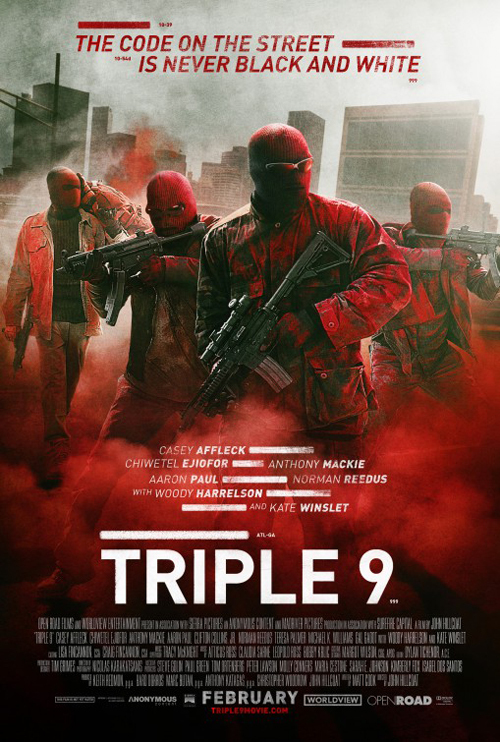 The Triple 9 (an office down) is suggested as a means to create confusion, so facilitating their second job (retrieving vital evidence from police custody); Affleck is to be the recipient, since Mackie objects to his encroaching on his territory (but then has second thoughts). If there’s little sympathy for the gang – Paul is even playing another of his hopeless junkie type parts, the perquisite unstable gang member – then Affleck’s performance appears to be entirely predicated on how much gum he can chew in any given scene. I’m not Affleck’s biggest fan, partly because he has a habit of showing up in roles for which he’s entirely unsuited (Gone Baby Gone), and his alternately savvy and rather slow cop (depending on where he needs to be for third act developments) is definitely not one of his more believable roles; it’s almost as if, with every chew of that gum, he’s thinking “I can play a convincing cop. I can play a convincing cop”. At least Harrelson is a welcome antidote to this, wholeheartedly embracing his livewire old pro and thus distracting from how thin the proceedings are. When Ejiofor eventually decides to blow Winslet up, you wonder why he didn’t do it in the first place (anyone could see she was never going to give him what he wanted, particularly after she starts demanding more for less), compounding a persistent feeling throughout of characters having insufficiently clear reasons for doing what they’re doing, not through intentional ambiguity but as a result of unclear plotting. Nevertheless, this is neither vastly better or inferior to some recent entries in the genre, such as The Town (overrated) and Takers (underrated). I tend to be an easy sell for this kind of crime flick, and Triple 9 kept me distracted but didn’t ultimately persuade me to invest in anyone in it, while the plot itself failed to take up the slack.